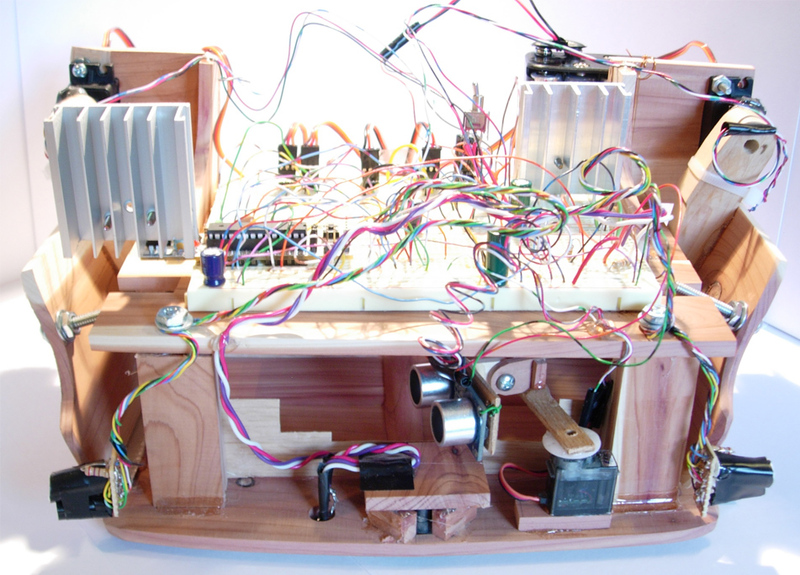 Let’s say that you’re trying to drive a few Nixie clock tubes, or you want to make a strobe light. 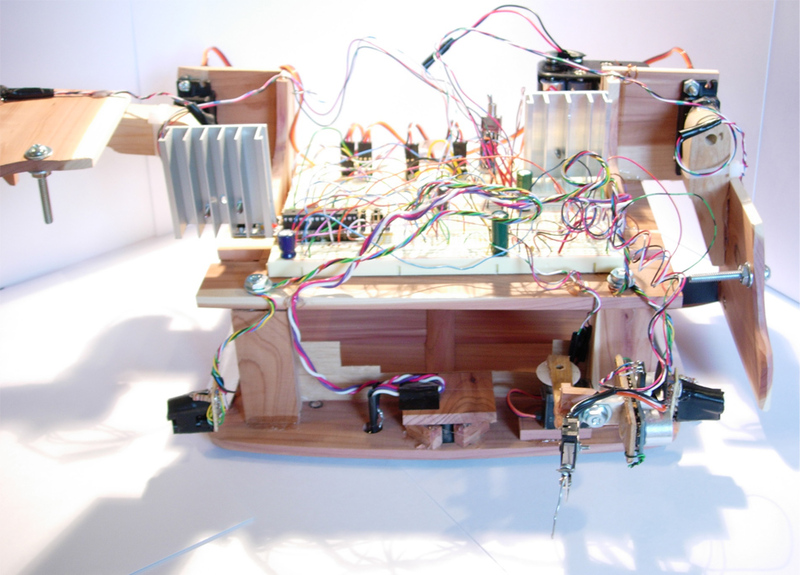 A variable high voltage DC power supply from 50-200+ volts may be required. Transformers are terrific, but difficult to find the right one and a pain to wind. 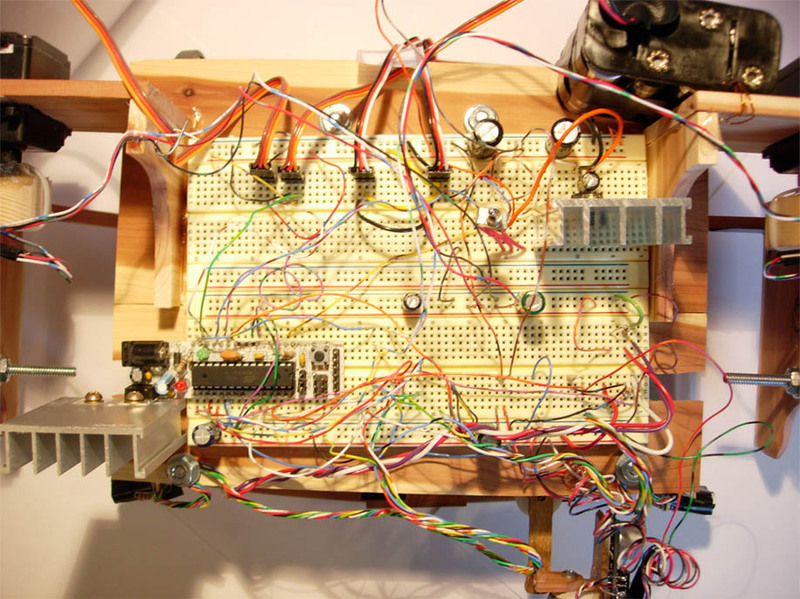 Why not use a boost converter? They’re easy and don’t necessarily require a guru for basic operation. This guide is meant for the individual who wants to build a simple boost converter, and may need refreshing on the theory. 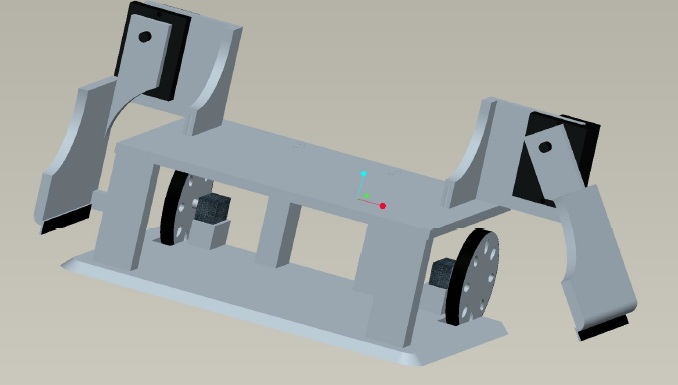 It will also help determine what parts will be required. Boost converters typically get less efficient as they increase voltage out/voltage in ratio. If 100+ volts are required from a 12v source, the load will need to be a fairly high impedance. 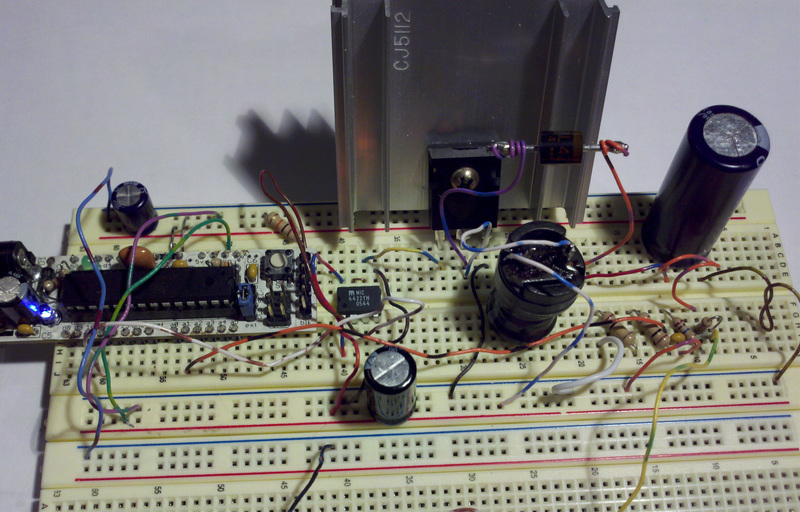 Don’t expect to run a 60watt light bulb from this boost converter! If precision is required, you may want a dedicated boost converter IC which will do the job better. This guide is intended for educational purposes. I’m going to be using, oh you guessed it — an Arduino for this example! As usual any micro controller will do (3.3v or 5v), but this project requires analog voltage reading. 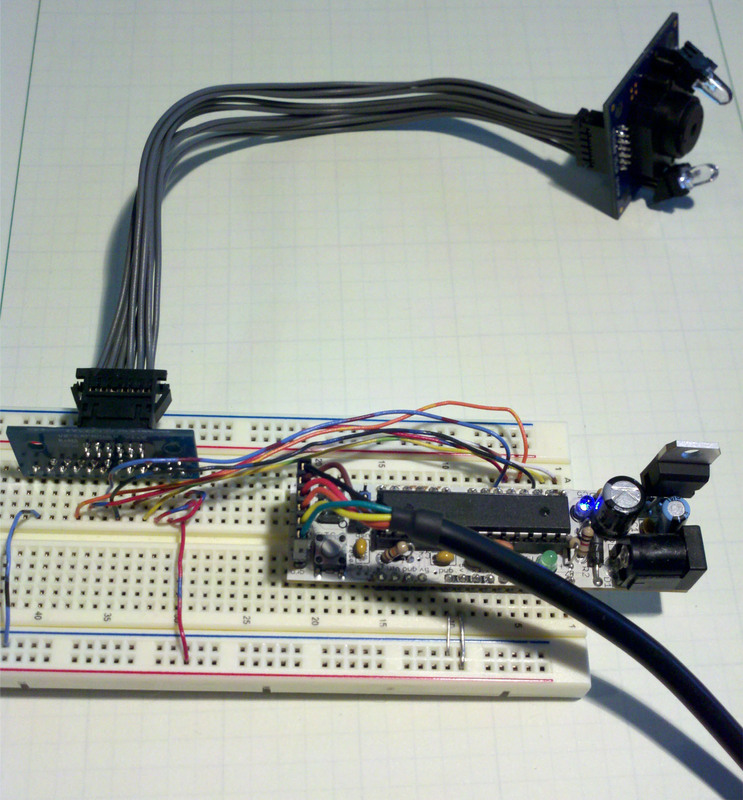 If your favorite micro controller doesn’t have an ADC (Analog to Digital Converter), buy one or you can make your own! Boost converters work by taking advantage of a fundamental property of inductors: inductors use stored energy to maintain current. The key is that the inductor will vary voltage to maintain whatever current was present before the system (circuit) changed. Once the power supply is removed from a charged inductor, it may be easier to think of the inductor as an electromotive force rather than a passive component. Refer to the images to see it a bit more illustrated. 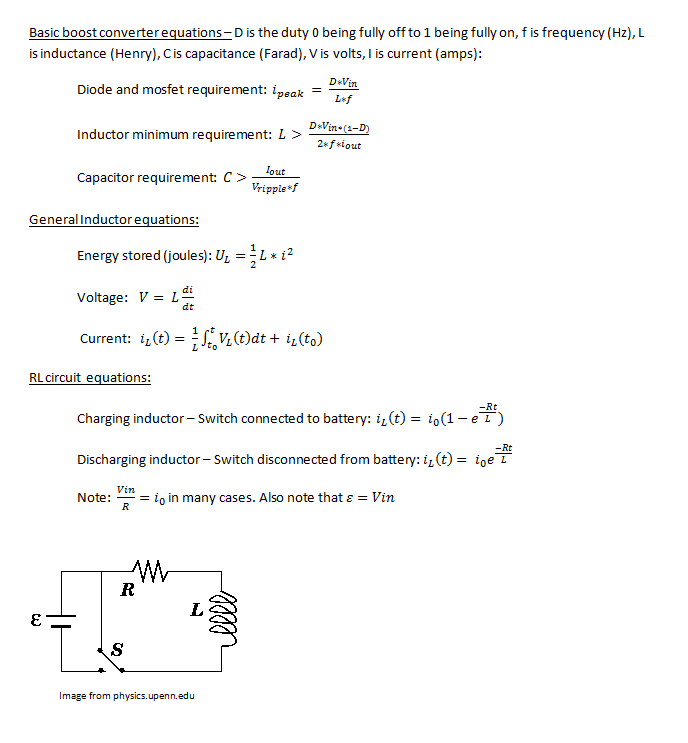 Some of the key inductor equations are also listed. 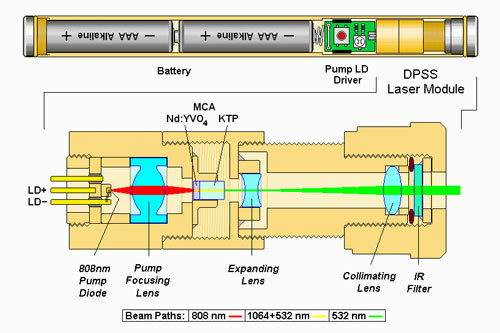 Basic overview. Original image from Wikipedia. 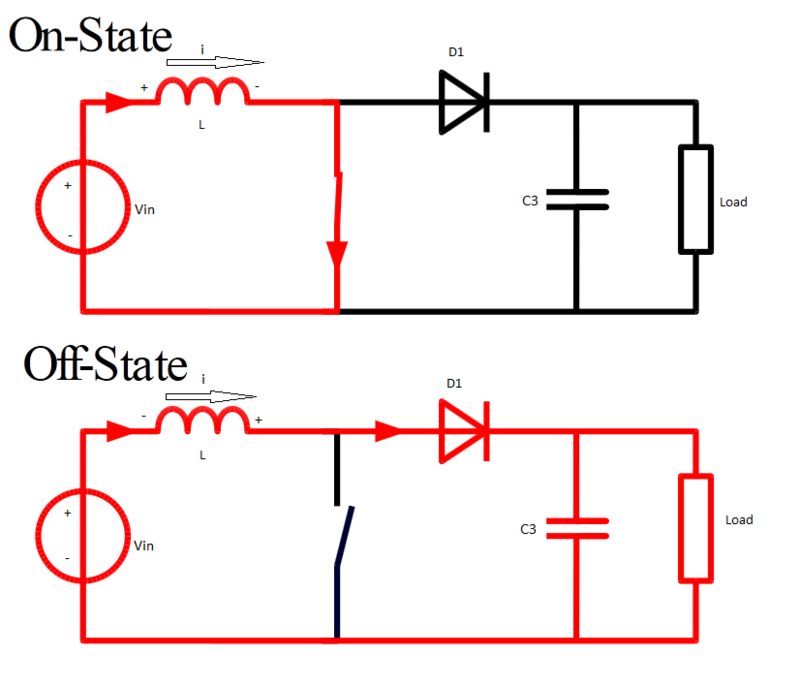 On state – Current can flow through the closed switch. There is a potential difference across the inductor. The fundamental property of inductors tells us that the inductor resists change in current. Initially the inductor current is near zero when the switch closes, but current will ramp up quickly as the inductor charges till the circuit goes into the Off state. Off state – Current no longer flows through the switch. 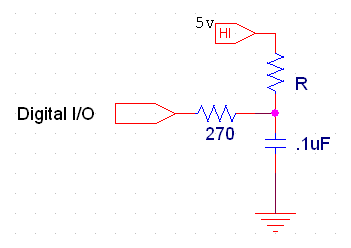 The inductor tries to maintain current, and it acts as a current source which means that voltage can sway, in this case it flips polarity due to discharge. The inductor voltage will immediately jump up to the voltage of C3 and maintain original current till the potential energy of the inductor is transferred to the capacitor. As the capacitor charges, the inductor will continue to jump up the the capacitor’s voltage, even if it’s much greater than Vin. Schematic, C1, C2 are 12V. C3, FET1, and D1 must be rated for high voltage output. Arduino shares ground with this circuit. 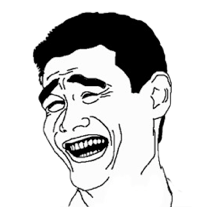 ~12v means around 12v, that’s not a negative. The mosfet(FET1), diode (D1), and capacitor (C3) will need to be rated for voltages greater than the peak voltage. 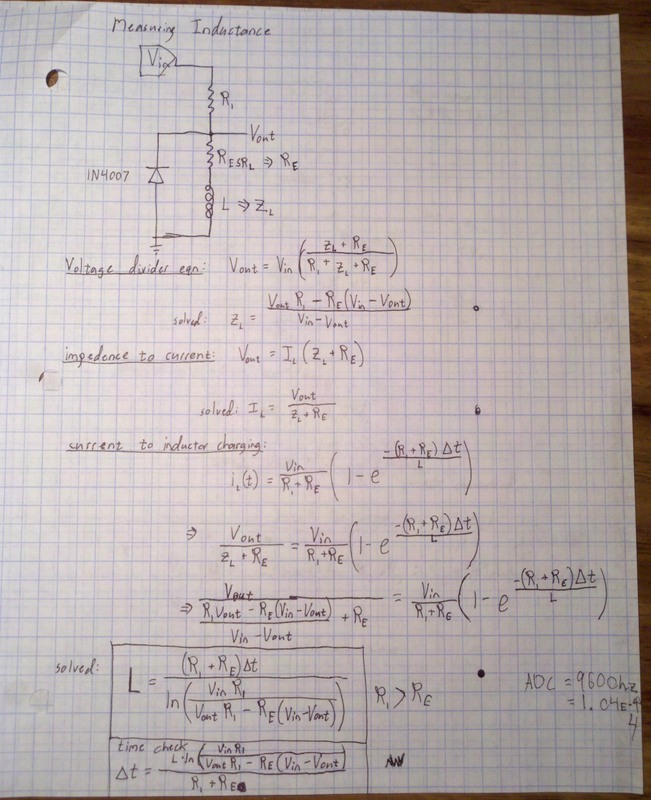 The mosfet and diode will need to have a current rating greater than the current peak — see equations. 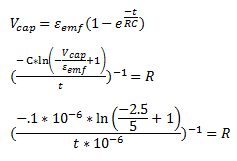 The more capacitance the better, and a ballpark number from the capacitor equation isn’t a bad idea. When it comes to duty, I would suggest not going over a .9 (230 duty for Arduino pwm) duty. 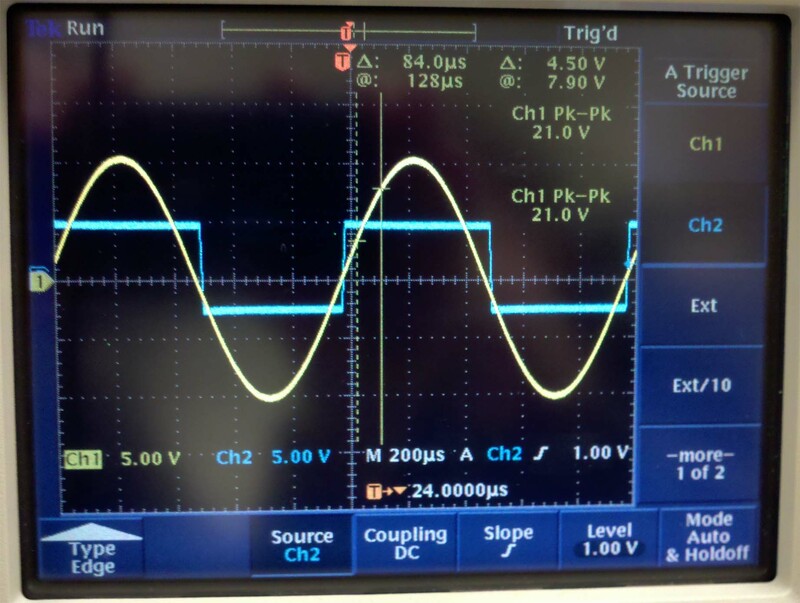 If you already have a diode you want to use, then use the diode’s max current as the peak current and solve for the duty. This will be the maximum duty without damaging the diode. Important: Mosfet Driver for the IRFP260N is required. This mosfet’s Gate-Source pins have a capacitor in parallel (downside on all mosfets). This capacitance is significant and will tend to resonate with the Arduino’s signal. This may damage the Arduino, and will dramatically reduce mosfet efficiency. 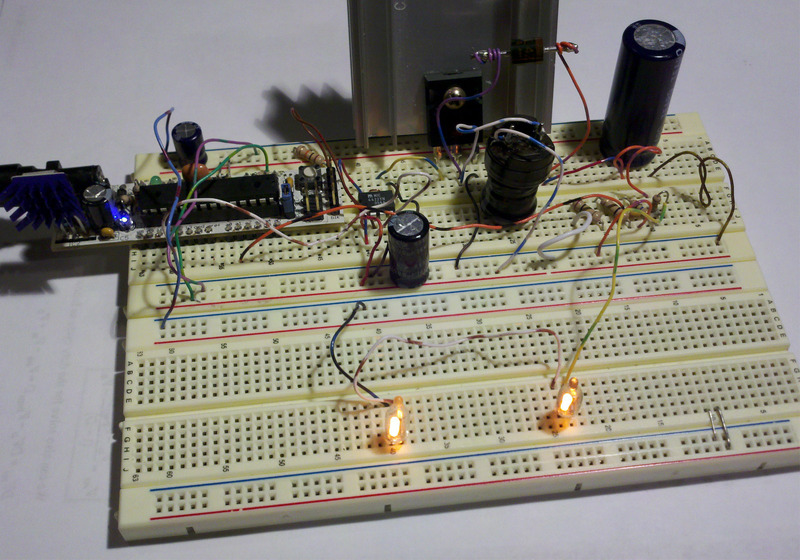 Frequency: My Arduino sample code will be using f = 31250 Hz pwm. It seems like any higher frequency results in a less efficient system, and 31250 hz is inaudible. This will also be using phase correct pwm – more on this in section 17.7.4 atmega328 datasheet. Feedback: There are calculations to estimate the high voltage output, but in reality there are many factors which affect this output. I found that a feedback system works better. 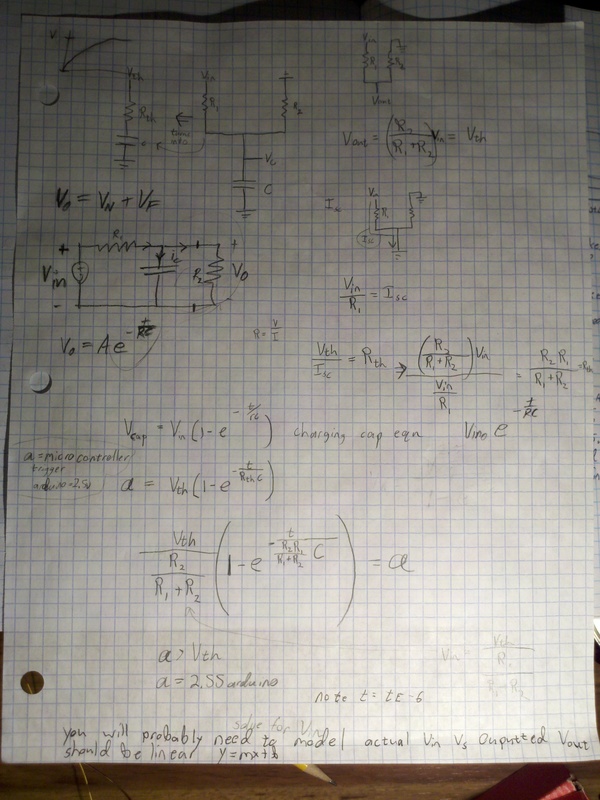 This feedback will output 5v when C3 is at 255 volts, and output 3.3v at 168V. 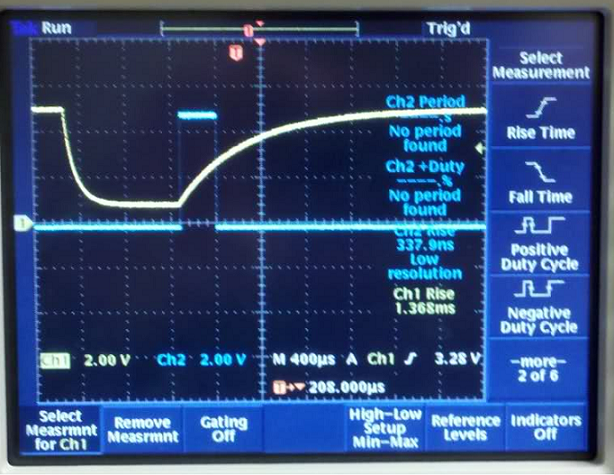 If the feedback voltage is too high for the ADC, adjust the voltage divider! Look at the TI pdf at the bottom (pdf pg 9). 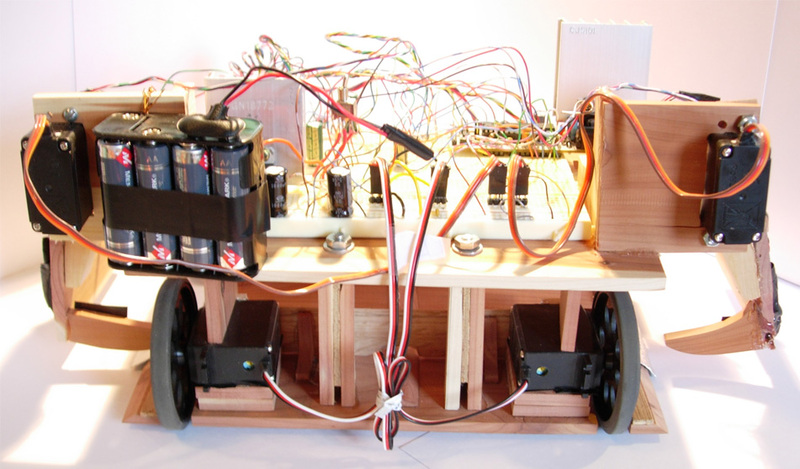 Capacitor – There will need to be a high voltage capacitor – larger the better. I used a 330uF 200V capacitor that I found in an old computer Power Supply Unit. Laptop PSU (usually), computer PSU, and CRT monitors will have decent sized high voltage capacitors. Find an old CRT monitor to dig into! Check my “Easy High Voltage” guide to safely discharge a CRT monitor. Buy some capacitors here, or here! Diode – A regular 1N4007, but it’s not recommended and will probably fail! A Schottky diode or some other ultra fast recovery diode is much better. There are some nice diodes in CRT monitors. I’ve used the RL4Z, 5JUZ47, 5VUZ47, all scavenged from CRT monitors. Buy some here, these should work too. N channel mosfet – IRFP260N available here or here, rated for 200v, 49A. Neon Light. With DC, the ground is what lights up! Mosfet Driver – I’ll be using the MIC4422YN. The MCP1407 or the UCC27424P should work too. If using more than 12 volts, watch the voltage requirements of these guys. Inductor – Buy or make your own inductor. I’ve used a 120uH, 871uH, 1000uH, and a 5000uH inductor with this circuit. All work fine. Larger inductors store more energy in its inductance which requires less current. 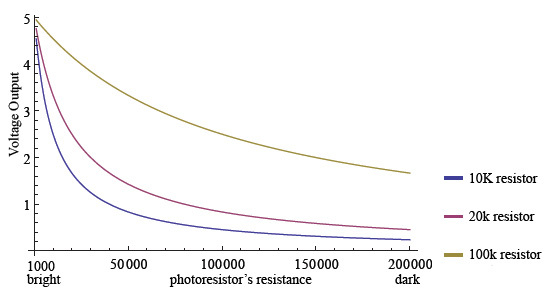 The main drawback is that Equivalent Series Resistance (ESR) is higher with inductors that have many windings. When buying an inductor, watch the current rating! 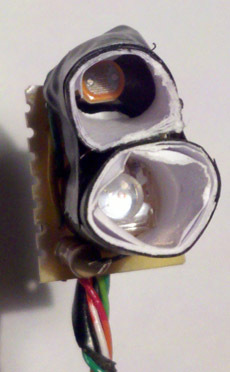 With boost converters, core saturation can be an issue with some designs. Remember that this design charges up a capacitor to 200V! This is dangerous and could be deadly if misused! The inductor is a current source when it’s discharging. Beginners are unfamiliar with current sources so I avoided explaining it like that. 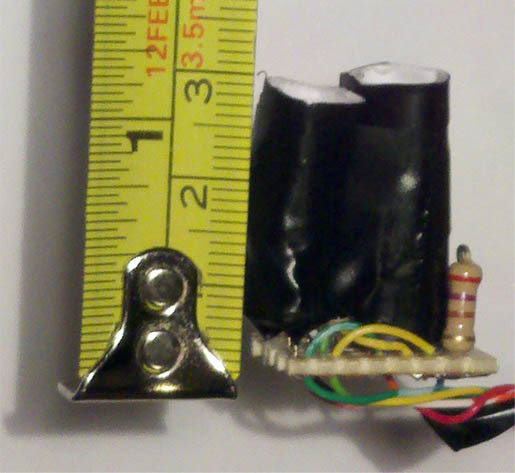 Here’s an example of a dedicated buck/boost converter IC from sparkfun! It’s always difficult knowing how in depth to go in the guides. My guide was written to get the nooblet up and on his feet. If this isn’t enough I’d suggest the links below. The TI boost guide really goes into detail. Working on a project which requires color detection, but you don’t want to bother with making your own color sensor? 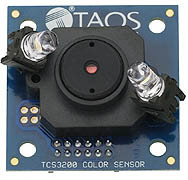 The TCS3200 is a great sensor offering sampling rates much higher than one made with a photoresistor. The main downfall to it is that the TCS3200-DB package from Parallax is very expensive ~ 80$ and more complicated to calculate spectral response compensation. 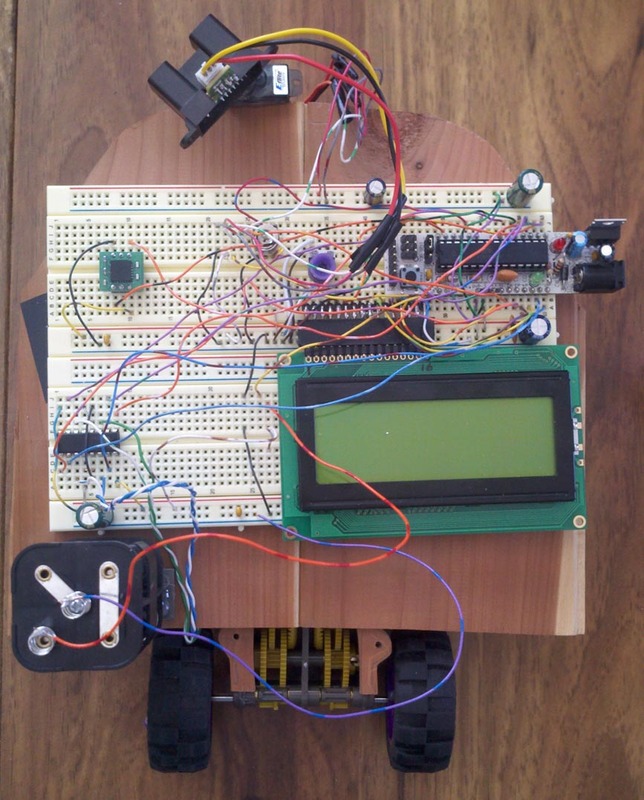 If you’re up for some fun, make your own color sensor! 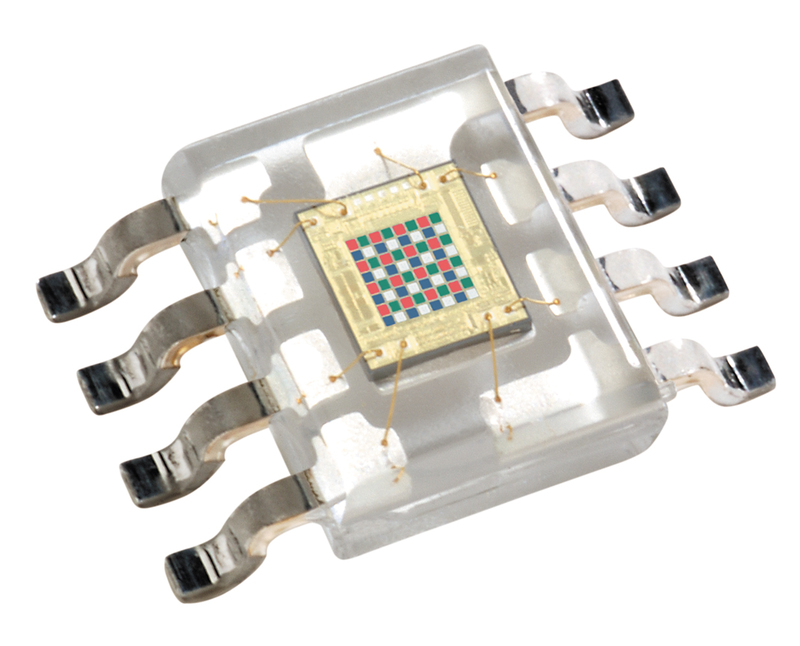 As you can see there is an array of photodiodes with color filters on top. There are four types of filters – red, blue, green, and a clear filter. 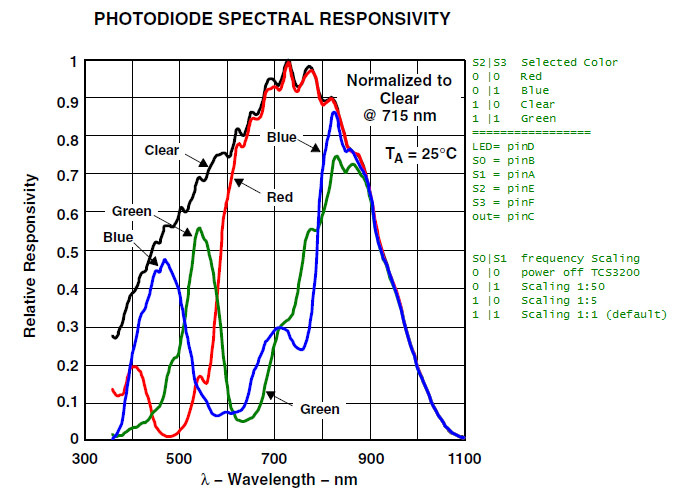 You may have noticed that there are multiple photodiodes of each color, and this helps reduce bad readings due to non-uniformity of incoming light. Excluding power, TCS3200 only has 1 output and the rest of the wires are all inputs. The output is a 50% duty cycle square wave with a frequency proportional to the light intensity (irradiance) on the selected filter. There are two pins to divide the frequency of the square wave S0 and S1, and two pins to select the color filter S2 and S3. The chip works from 2.7V to 5.5V, so it’ll work fine with 3.3V or 5V micro controllers. When using the TCS3200-DB with Arduino: Connect Vdd, V, and +5v to the Arduino’s 5V line, Gnd connects to the Arduino’s Ground. All other wires are on the example program. The program will need to determine if there an object in front of the sensor. 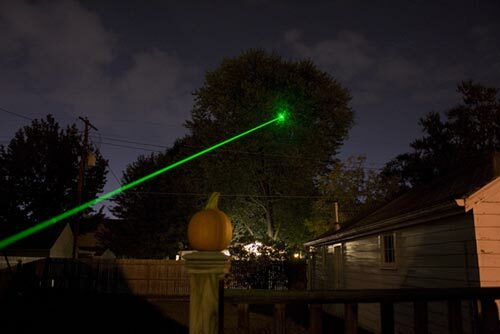 If there is an object present, then figure out what color it is. I will be looking at the TCS3200 output’s rising edge to the falling edge, so the less time elapsed means that there is more light. 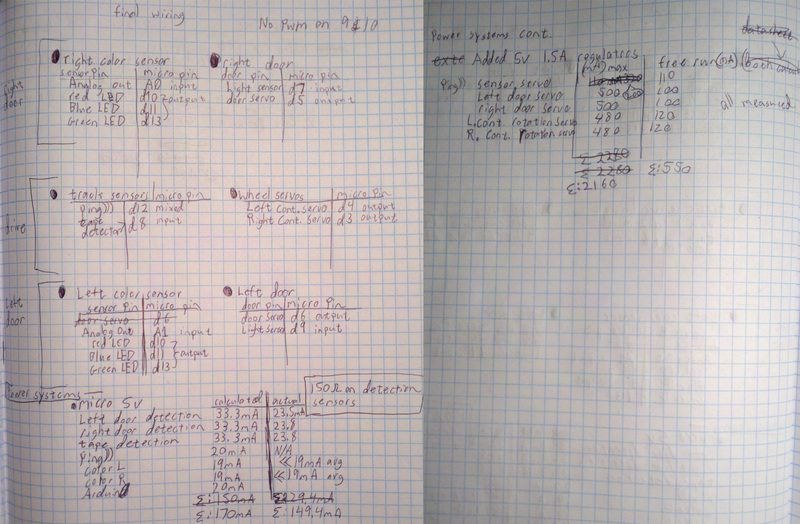 There will be some redundant readings, but this is to help ensure correct detection if anything is moving. Take a measurement with the LED off, then compare that to a measurement with the LED on (line 53), both using the clear filter. If there was a significant difference then that means that there is an object in front of the sensor. If there wasn’t a significant difference then just return a zero (line 61-64). Take a clear filter reading and compare it with readings of each color filter, both with the LED on (line 67-72). Then do somewhat of a reverse ratio, since smaller means more light, and pick the largest reading (lines 70 – 96). Now there will be a serial output of all the ratios and this program simply selects the largest. 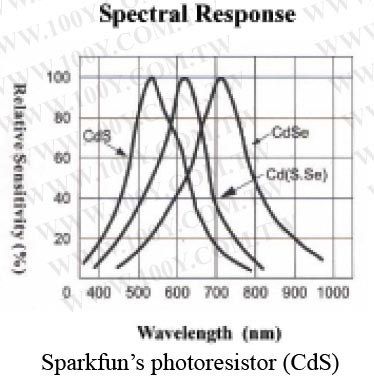 If you need more accurate readings instead of just the primaries, then I suggest divide the ratio with the spectral response found in the datasheet. Spectral and pinout from datasheet. 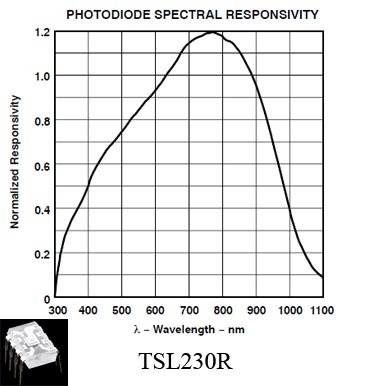 Note: if you're using the product from Parallax, use the spectral response from their TCS3200_doc.pdf. There are plenty of comments in the programs below to help the user get started. there is a detectColor(TCS3200’s output square wave pin) that will return a 0 if nothing is in front of the sensor, 1 for red, 2 for blue, and 3 for green. After each reading it will power off the TCS3200 chip and LED. I don’t fully support the Parallax Propeller, but I did write a simple program to do basic readings.